Long has a single fact ruled the gaming peripherals market: Wired peripherals are better than wireless, and for damned fine reasons. Better response times. No worries about battery life or extra weight. No worries about connectivity. Wired peripherals are reliable. Now, is it true? Hard to say. Every gaming mouse (wired or not) claims a 1 millisecond response time these days, including all the ones mentioned above. We’ll have to do some side-by-side testing, as best we can. More importantly, does it matter? Probably not. Not to you anyway. Hardware delay at those levels is probably imperceptible to the average user. But beating this drum is part of Logitech’s larger goal here. “We’re trying to change a persistent and incorrect mindset about the way wireless mice work and can perform,” says Logitech’s Chris Pate. So they’ve also made a wireless mouse that’s stunningly lightweight—107 grams, which is almost the same weight (105 grams) as the wired DeathAdder. Razer’s wireless Mamba, by comparison, is 125 grams. The G900 saves a lot of weight in the battery, packing a diminutive 15 gram 720mAh battery but wringing a full 24 hours of use out of it. By comparison, Logitech says they broke down a Mamba and found a 31 gram, 1800mAh battery—or twice the weight and capacity—but Razer lists the Mamba’s battery life at 20 hours. And I haven’t even mentioned that the G900 uses the same sensor as our favorite gaming mouse, Logitech’s G502 Proteus Core. 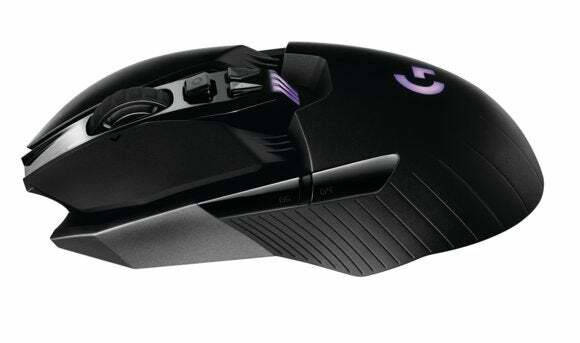 Or that it has the same dual-mode scroll wheel as the G502. Or that it’s an ambidextrous mouse, with removable magnetic thumb buttons for each side so you can make it left- or right-handed. We’ll have a more in-depth review once we’ve had time to play with the G900, but if Logitech’s claims hold true then this might be the best wireless gaming mouse we’ve seen.